As industrial organizations continue the drive to increase palm oil plantation production and paper making on the island of Sumatra, this Orangutan suffered serious injuries at the hands of an air-gun toting poacher. The mother Orangutan lost her new born baby as a result of this attack. She had 74 air pellets in her body when rescued by an animal shelter, blinded with six pellets in her eyes, many broken bones, including a broken collarbone. This is all really sad stuff, not to mention the cruelty of it all, as pressures increase to de-wilderness the island putting at risk the remaining rare populations there of Asian elephants, tigers, rhinos and orangutans (and many others). Environmental activists: Email, mail, call or text the national and local governments there, including the tourism associations involved with the area. Some of the irony here is that western heart-related doctors recommend against the consumption of tropical oils (includes palm oil) as being detrimental to health. Maybe that message has not yet reached South East Asia. 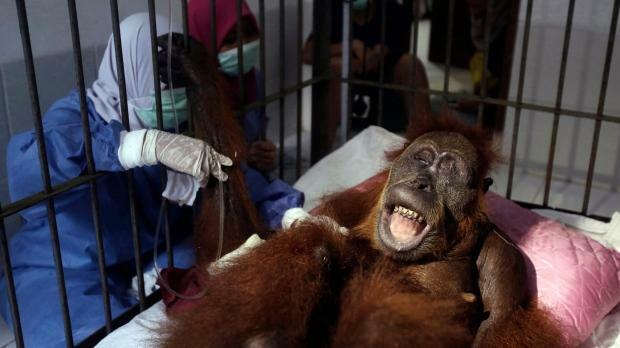 Palm oil is certainly proving harmful to the animal populations, previously mentioned here. Chief Justice of the Land and Environment Court Brian Preston SC handed down his judgment today in a landmark case, refusing approval of a new coal mine to be built just outside of the town of Gloucester in the NSW Upper Hunter Valley. via Landmark legal win for climate and community — The Animal, Tree And Homeless Campaign.